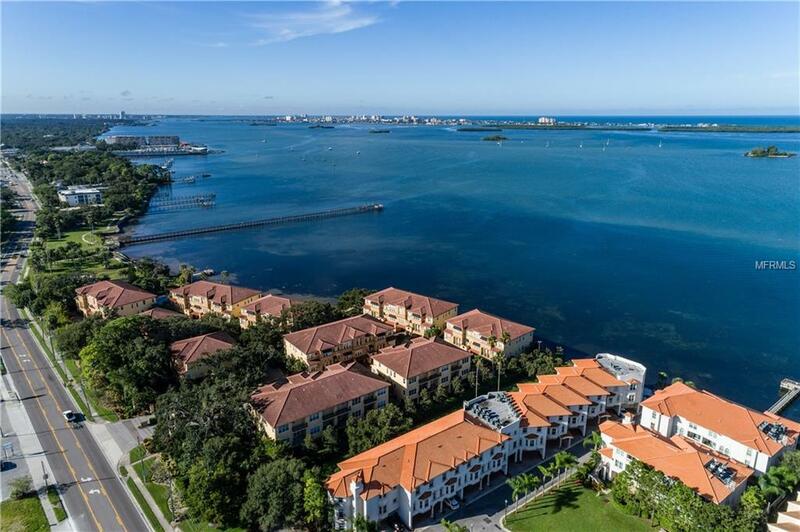 Welcome home to this gorgeous waterfront townhome at the beautiful, gated, San Ruffino community in Delightful Dunedin. Located at the edge of spectacular St. Joseph Sound, San Ruffino offers maintenance free living just a short distance from downtown Dunedin, the Pinellas Trail and Honeymoon Island. The home offers a private elevator to the main two floors where you will enjoy many wonderful features. The three bedroom, 2 bath home has solid wood cabinets and granite countertops in the kitchen and baths. Top brand stainless steel appliances, an amazing butlers pantry and eat-in dining make this kitchen one of the very best. The main living level with beautiful ceramic tile flooring, crown molding and plantation shutters is bright and inviting and leads out to the peaceful breezes of the main level balcony, one of three porches in the home. The master suite with private bath boasts a spa tub, two closets and another balcony. Two additional bedrooms and a full bath complete the top level. Additional rooms include the well-appointed laundry room and an office. Built to 2009 storm codes, including hurricane resistant windows and doors, you can feel secure in this wonderful neighborhood. Unlike some nearby complexes, the monthly fees include building and flood insurance along with many other services. The community pool and dock offer spectacular views of Caladesi Island and nightly sunsets. Top it all off with a two-car garage and this is truly the perfect home at a perfect price. Additional Water Information San Ruffino Complex Sits Prominently On St Joseph's Sound And Offers Expansive And Direct Sunset Views Over The Sound And Towards The Gulf Of Mexico. The Community Pool And Heated Spa As Well As The Pier And Walkways All Have Direct Views Of The Sound. Additional Lease Restrictions Buyer Must Verify Lease Restrictions With Jodi Roberts With Creative Mgmt. 727-478-4909. Pet Restrictions Buyer Must Verify Pet Restrictions With Jodi Roberts With Creative Mgmt. 727-478-4909.